Police have not said how many people being held in cafe. 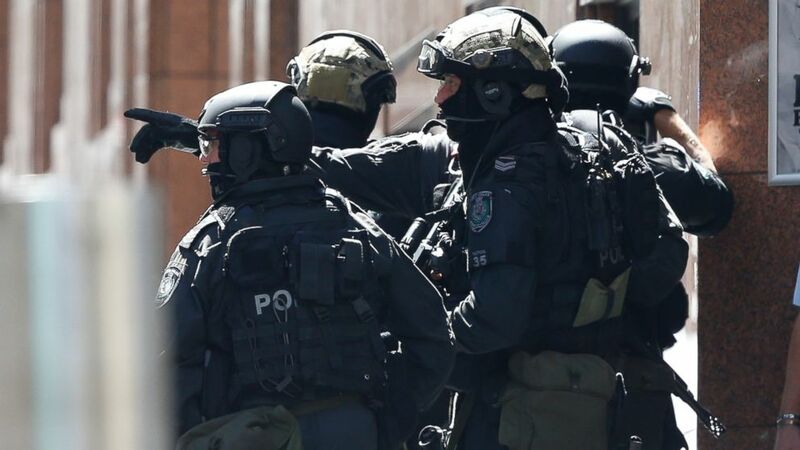 Three people were seen fleeing from a Sydney cafe after they had been taken hostage -- with others still held inside as neighboring blocks remain locked down as police tried to make contact with the armed perpetrator, authorities said. The hostages were being held in the Lindt Chocolat Café, a chocolate shop and cafe in Sydney's Martin Place, the city's financial district where the Reserve Bank of Australia and several commercial banks have their main offices. The area is also close to the New South Wales state parliament. 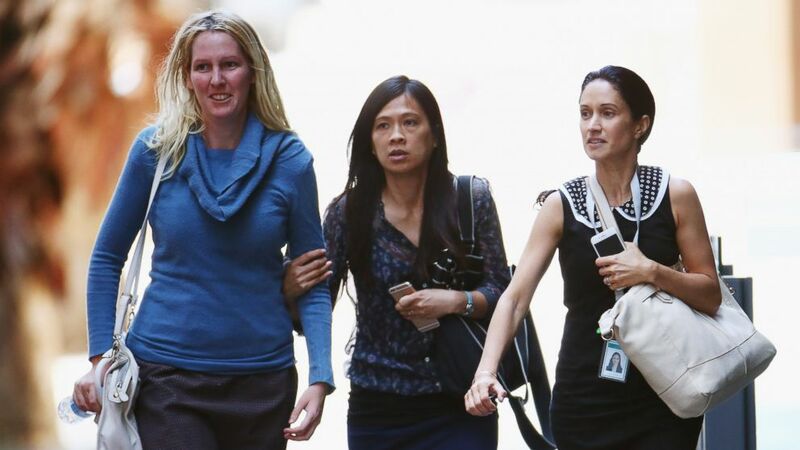 New South Wales Deputy Police Commissioner Catherine Burn confirmed that three people had gotten away. "The first thing we will do is make sure they are OK and then we will work with these people to find out some more information,” Burn said. “Our No. 1 aim is to resolve this incident peacefully." Police negotiators are in contact with the armed hostage-taker, but the motive remains unclear, Burn said. Earlier in the day, video emerged showing people being held inside the shop with their hands held in the air. Two women were also seen inside the cafe holding up what appeared to be a black flag with white Arabic writing on it. New South Wales Police Commissioner Andrew Scipione said there is at least one armed person holding an undisclosed number of hostages in the cafe. Police have not yet had contact with the hostage taker, he said, adding that the situation began Monday at 9:45 a.m. local time. In a statement on Facebook, Lindt said, "We would like to thank everyone for their thoughts and kind support over the current situation at the Lindt Chocolate Café at Martin Place. We are deeply concerned over this serious incident and our thoughts and prayers are with the staff and customers involved and all their friends and families. The matter is being dealt with by the authorities and we are waiting for any updates from them." (Daniel Munoz/Fairfax Media via Getty Images) Police officers chat on the scene of the siege at Lindt Cafe in Martin Place on Dec. 15, 2014 in Sydney, Australia. They are also looking at the flag the hostages have been pictured holding. Scipione also said police have not yet confirmed it is a terrorism event, but they are acting in a manner consistent with a terror attack. "We don't yet know the motivation of the perpetrator," Australian Prime Minister Tony Abbott said at a news conference earlier in the day. "We don't know that this is politically motivated although there is some indications that it could be. We have to appreciate that even in a society such as ours, there are people who would wish to do us harm." (Don Arnold/Getty Images) Girls rush through Philip Street past armed police at a cafe on Dec. 15, 2014 in Sydney, Australia. Several nearby offices were evacuated as a precaution, police said. People in buildings in the neighboring streets were directed to remain indoors and stay away from open windows. "There's a real sense of alertness, awareness, and a bit of shock to be honest," said Lisa Martin, who works in an office nearby the cafe and was in lockdown. "To know that there are so many people just having coffee and a chocolate are now in a hostage situation is really sobering." (Peter Parks/AFP/Getty Images) Armed police are seen outside a cafe in the central business district of Sydney on Dec. 15, 2014. 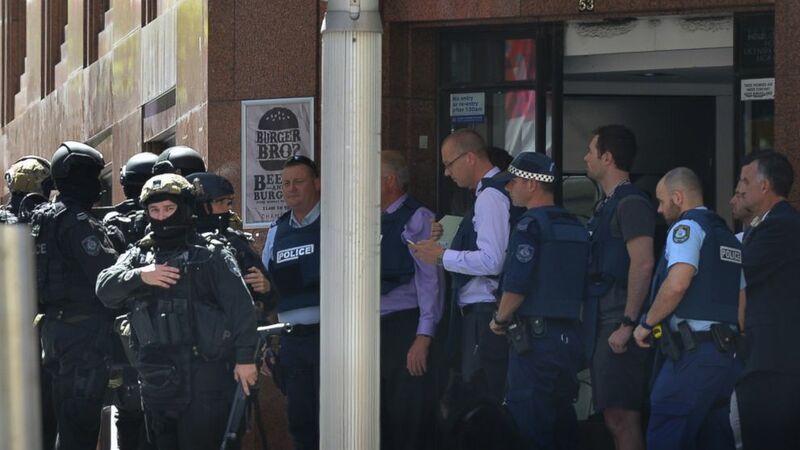 Earlier, video that aired on Channel 9 Australia showed police with weapons drawn, their attention focused on the cafe. Police said emergency services had responded and streets around the area had been closed. "New South Wales Police and the Australian Federal Police are currently responding to a reported hostage-taking incident in Martin Place in Sydney," Abbott said. He said the National Security Committee of Cabinet has convened for briefings on the situation. "This is obviously a deeply concerning incident but all Australians should be reassured that our law enforcement and security agencies are well trained and equipped and are responding in a thorough and professional manner," he said.